At the seminar in Scotland on Destroying the Poverty Spirit, we spent a lot of time discussing design. The central point is that we need to be able to search out design in another person and to language it and celebrate it. One of the subpoints was that knowing your design is a powerful thing, even though you cannot see any utilitarian value in that facet of your design. I used Serina as an illustration. 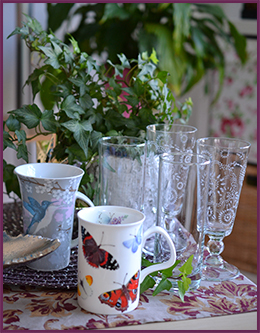 After having been in her apartment a few times, I observed that all of her drinking glasses and cups were tall and slender. No short, fat drinking vessels exist in her house. This is by design. It is so solidly baked into her core that she was not even aware of it. She simply avoided short cups like a plague and gravitated towards the ones God made her to like. This was her design. It was placed there by God, not something she learned in school or from the culture. And it was not the result of a wound. It was wholesome. But much more to the point, I could see absolutely not the slightest application to the Kingdom or any other “usefulness” of tall glasses versus standard. It was simply her kind of beauty. I taught that in the forenoon. At lunch we went to a restaurant and were served by a waitress who knew NOTHING about the seminar. The two people across from us got served in very short, very fat glasses. Standard for the restaurant. I saw them all around on other tables. I was served with a fairly standard glass. Not short. Not tall. Not skinny. Not super-sized. Just a glass. And Serina was served with a fancy, glass considerably taller than mine. Clearly God was making a statement. 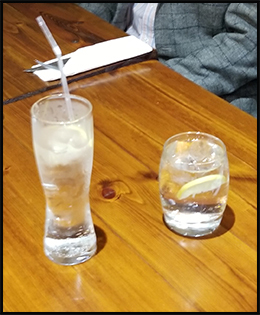 He was enjoying her enjoying her joy and He had no difficulty ordering up her special glass in a restaurant in Scotland, just to make a point that design matters. sooooooooooo wonderful to see this , thank you for letting us rejoice with him and see her joy ..very contagious ....thank you for the 3 questions !!!! When I saw the photo of Serina's special restaurant glass, I immediately teared up. That's something for me to ponder. I am a Prophet Redemptive and drawing out people's design is my superpower. Beauty , Design and the Redemptive Gifts. Lovely !! How God has created us unique, fearfully and wonderfully in our design! Thankyou for sharing this story of God's beautiful ,thoughtful details in Serina's design! Marveling time and time again for how God plans ahead to relish in the joy He brings our way in day to day activities with little or big wows in our lives. I am experiencing a new kind of joy as I have been learning our design in the redemptive gifts ,discovering and living out my own ;asking God what my spouses is and as well as our 4 kids and 4 grandkids. To see how each is built;what their core design is; how I can pray into it ,encourage them and celebrate this "new joy" of God pouring out a part of Himself ; ,flowing thru us with His power ; bringing joy ,pleasure ,smiles into our spirits and glory back to Him . I love how our Father loves on us! He is big on details, even if I miss half of them! And the phrase... “in the forenoon” is a special phrase, it suites this setting, as if you picked the absolute right colour to paint this picture. I love the sound of it. This was an altogether very good day in the books. Arthur, you lived out your design by calling out design, and you had a day of beautiful fun, glasses filled to the brim with joy. I delight in the idea that Father orders up a design tailored to our design. Such a good lesson. We can trust Him with the details of our hearts. I love this! Such a delightful Father who enjoys the tiniest details in our lives! Remember that last white elephant gift you got? Too good to throw away, not good enough to use anywhere. God doesn’t do white elephant gifts. He designs us for success. He also designs us to experience our own flavor of joy.